Queen of Hearts Productions, Inc. Is Bringing Street Art to PeaceRaiser 6: Power to the Peaceful! We’re thrilled to announce that PeaceRaiser 6: Power to the Peaceful will feature a pop-up art gallery curated by Queen of Hearts Productions, Inc. Buy your PeaceRaiser tickets here! Queen of Hearts Productions, Inc. 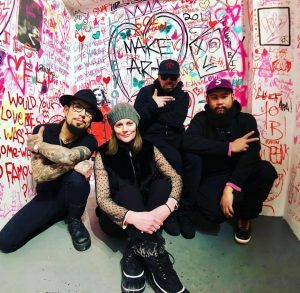 Founder Rachael N. Clark, with artists Dave Navarro, Savior Elmundo, and AJ Lavilla. Picture taken at the exhibit Street heARTS: Valentines & Confessions. We hope you can join us on May 16, 2019 for this exclusive evening filled with art, entertainment, an open bar, and great food! Early Bird tickets are available until May 1, 2019! Queen of Hearts Productions, Inc. is bringing street artists together to create and submit original pieces of art incorporating the theme of restorative justice and the spirit of New York Peace Institute’s mission. These pieces will be available for purchase at the silent and live auctions. VIP guests are invited to come early for a special happy hour with participating artists from 5:30 to 6:30pm! Learn more about Queen of Hearts Productions and founder Rachael N. Clark at www.weheartstreetart.com and follow her at @greenguccigirl.